A Thought Shared ....: It's Time To Play Again.. The first picture shows a smoke plume. It's of the type you may have seen for real or on TV where there has been an explosion caused by an explosive device, maybe plastic explosive or dynamite. Notice how the smoke cloud is rapidly starting to 'detach' itself, that is to say, there is little follow up smoke or anything else directly below it. 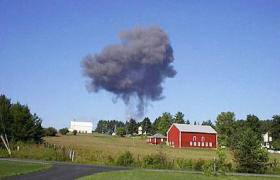 This is a very different kind of plume that comes from an explosion and subsequent fire at an oil refinery, airplane disaster or store fire, where a much blacker smoke and flames are seen rising to quite a height and for an extended period dependant upon the amount of combustible material at the site. The second picture is of a site where, again, some destructive force has left its mark. There is evidence of smoke and heat, again left by some small explosion. Part of the ground looks a little charred, but grass directly around the area has suffered little or no damage. Some soil has been piled up, and it is plainly obvious that something has been 'going down' here. The third picture is an expanded view of the second, and again does not show that much has happened here at all. There is smoke in evidence, but were you to take a quick glance at a place like this, you might consider at best that a small fire maybe gotten out of hand but has been put out. OK. Time for the game. Looking only at the second and third pictures, can you spot anything in them that would lead you to believe that a full sized, twin engined Boeing airliner carrying passengers and luggage crashed here? If you are wondering why I am putting this question to you, the answer is simple. These pictures are not just anyplace. 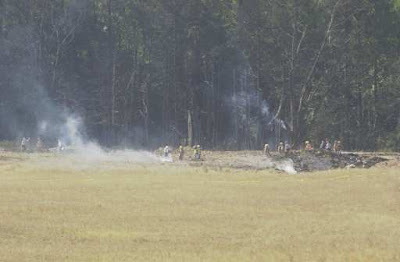 These pictures are of the Shanksville, Pennsylvania Flight 93 crash site, taken not too long after the event. Have you ever seen an airplane crash site so devoid of wreckage? Cast you mind back to any news item where an airliner has crashed into a mountain, or anyplace other than the crash sites of September 11, 2001 and honestly tell me that they were the same as this. The first picture of the smoke plume is so unlike any other emanating from a crashed airliner still with half of its fuel load onboard, and yet we are told that it was, and we are expected to believe what we are told. Do your eyes tell you the same story as you were fed at the time? 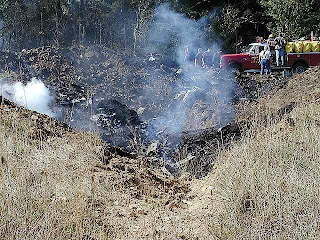 Flight 93, according to United Airlines, landed at Cleveland Airport a while after it apparently crashed at Shanksville. If Flight 93 did NOT crash here, and did land where United believe it to have landed, then it follows that the passengers on board of Flight 93 did not perish at Shanksville either. So if they didn't die here, where was their place of execution. More to the point, who were their executioners?